Atriuum is the Nichols Library’s online catalog and circulation system. Atriuum is accessible from your home computer or mobile device. Use Atriuum* to Manage your reading. You can use Atriuum to browse for the catalog, renew items and place reserves. Begin by logging in to your account (see window on the upper right of the catalog sereen). Enter your user name (last name) and pin (library card number). Once in, you will see a list of titles you chekced out and on reserve. Select History to see what you have checked out over the last year. To renew an item, go to your Items Out list, check the title box and click on the renew button at the foot of the page (limit of 2). To reserve an item, Search the catalog. When you find your item, click on the title and in the popup window, click on the reserve button. You can also add the title to a bookbag, which keeps track of titles you want to read or collects titles on a topic. Or make a watchlist of authors, series and subjects you follow. About our collection. 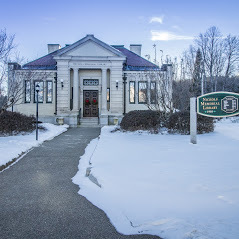 The collection of the Nichols Library includes print, digital and historic materials, prize winners, recognized classics, bestsellers and popular genre titles. For young readers, the library has a collection of over 3,000 titles than include read-aloud picture books, step-into-reading stories, chapter books, and longer stories for middle readers and teens. Our historic collection includes over 300 books on New Hampshire history, towns, and places of interest. Two journals, Granite Monthly and Historical New Hampshire, contain profiles of NH towns, persons and events. The library’s archive and clippings file contains material of interest on the history of Center Harbor, the Nichols Library, and Belknap College. A small selection of books from the original collection is till held by the library. *Atriuum is a product of Books Systems Inc. This web-based system is “browser-based”, allowing patrons “instant access to the .. resource materials housed at your library from any Internet connected computer or mobile device.” Nichols Library has been using Atriuum to manage our catalog and circulation since May, 2012.